The new Leica Duovid 8to12x42 and 10to15x50 binoculars are a significant departure from everything else on the market today. As the name implies, these binoculars actually feature two magnifications each. The 8+12x42 model can switch between 8x and 12x magnification, and the 10+15x50 model can switch between 10x and 15x. In so doing, the Duovids force us to adjust our thinking about multiple power binoculars in general. First, these are not zoom binoculars! Leica was very careful to name the Duovids with a "+" for "and" rather than a "-" for "to". These are binoculars with two fixed magnifications that the user can toggle between. Traditional zoom binoculars focus at every intermediate setting between the highest and lowest magnification. But such zoom binoculars often yield very poor optical performance, in part to accommodate the zoom feature. While the Duovids can be dialed to intermediate magnifications, they are not calibrated to allow matching of the eyepieces except at the extremes. Trying to use them with mismatched magnifications can lead to eyestrain and headaches, and Leica recommends strongly against doing so. The switching mechanism is the same on both models and is fairly simple. The user simply applies a ¼ twist to a rubber-armored ring on both oculars. The action is deliberately stiff, to prevent it happening by accident, but it is not difficult. However, it is not as simple as focusing or using the zoom function on true zoom binoculars. Switching pretty much requires that the user lower the binoculars, adjust each ring, and then lift them up again. The point is that the user must choose the power they intend to bird with and recognize that switching on the fly may mean losing some birds in the field. So how well do the Duovids do this? The short answer is: very well indeed. The long answer is the rest of the article! As should be expected on a high-quality roof prism binocular, Duovids are completely sealed and nitrogen-purged so they are fogproof and waterproof. Unexpectedly, they are waterproof even submerged to a depth of 16.4 feet! The prisms are phase-coated to minimize color aberration, and the lenses are fully multi-coated both to maximize light transmission and increase scratch resistance. Optically, these are beautiful binoculars. The image is tack sharp right to the edges of the field with no detectable edge effects. With the Duovids, both magnifications have the kind of bright, high-contrast optical performance that birders expect from Leica. Both binoculars are noticeably darker at their higher magnification, but this is only to be expected as the exit pupil decreases. Color fidelity is excellent, without a hint of distortion or aberration. The field of view on the 8+12x42 model is 360 feet at 8x and 270 feet at 12x, both measured at 1,000 yards distance. For the 10+15x50 model, the comparable numbers are 295 feet at 10x and 230 feet at 15x, again at 1000 yards distance. The minimum close focus at 8x is listed in the Leica literature as 12 feet. We measured it at 10 feet, whereas at 12x, this increased to about 15 feet. The 10x model close-focused to about 13 feet, while at 15x, they focused to about 17 feet. One amazing feature of these binoculars is that, when switching magnification, the image remains in focus – if it was sharp at 8x, it’s still sharp at 12x without re-focusing! The diopter adjustment is a knob located in front of the focus knob. To adjust, pull it up towards the ocular lenses until it turns freely. The Duovids can be adjusted +/- 3 diopters in a mechanism that is very sensitive – the slightest touch makes a big change. Push the knob back in to lock it in the desired place. The diopter also compensates automatically to retain sharpness when the magnification is switched. 8+12x42 14.5 mm 360 ft/1000 yds 12.0 ft 37.0 oz. 4.8" x 6.2" x2.7"
10+15x50 14.5 mm 273 ft/1000 yds 12.9 ft 43.7 oz. 4.9" x 7.6" x2.8"
The Duovids go from minimum close focus to infinity in slightly less than 1¼ turns of the focus knob. The knob is large, rubber-armored for a sure grip, and turns relatively easily, even when brand new. Sharp focus is relatively easily obtained, particularly as these binoculars seem to have an impressive depth of field. Depth of field was notably better than on the Trinovid model of the same magnification. 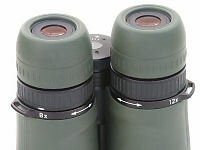 The eye relief on both models of the Duovids is 14.5 mm at lower power, and 14.3 mm at higher power which may present a problem for some birders who wear glasses. The eyecups adjust with a twist-and-lock mechanism that is locked by detents at the fully in or out positions. Birders familiar with Leica’s popular Trinovid model will quickly note a departure from that line’s recent designs. Where the Trinovids are squat and blocky, housed in hard rubber armor with uncomfortable ridges, the Duovids are slender, classic-looking roof-prism binoculars. The armoring (available in either black or olive green) is smooth appearing, but soft and textured for a secure, comfortable, no-slip grip. The Duovids have a slight thumb groove just beneath the oculars that increases user comfort. The mounting brackets for the straps are just above the thumb groove, out of the way of the user’s hands. The eyecups are made of a comfortable soft rubber and taper so that they feel more comfortable against user’s eye sockets. Such comfort issues are significant. At 37 oz. (nearly 44 oz. for the 10+15x50 model), the Duovids are heavy enough that any ergonomic optimization will help minimize the fatigue of carrying them for a long day in the field. The rainguard is a pair of soft rubber cups with a flexible linker region that fit snugly over the ocular lenses. The strap threads through a bracket on the left side. The fit of the rainguard is tight enough that it cannot be dislodged even when the binocular is inverted and shaken vigorously. We did not receive objective lens caps with the Duovids and so, cannot comment on them. The strap is an angled neoprene device with ample padding that was really quite comfortable. The angling seems to make the binoculars sit closely on the chest with less bouncing while walking. The case is leather, reinforced on the bottom, and equipped with a Velcro-closing flap for the strap to fit through. At $2,599.00 for the 8+12x42 model and $2,799.00 for the 10+15x50 model, these binoculars are among the most expensive out there, but it's almost as though you are getting two binoculars for the price. With the Duovids, you probably are getting everything you pay for, and a bit more as well. They are also one of the most innovative and multifunctional binoculars we’ve reviewed. Sometimes you just need that little bit of extra power to identify that raptor perched at the limit of conjecture, or to see that last subtle plumage detail. We couldn’t help but give these attractive binoculars a thumbs-up. 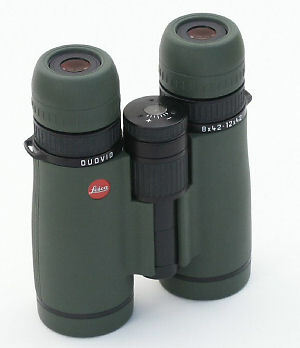 Find more info for the Leica Duovid Binoculars Here.